Whale watching is an activity that can be experienced in many places around the world. These, and other, sea mammals live in relatively close proximity to portions of the earth that human inhabit, but seeing them can sometimes prove tricky. That’s when you enlist the help of the experts to aid in your cetacean pursuit. 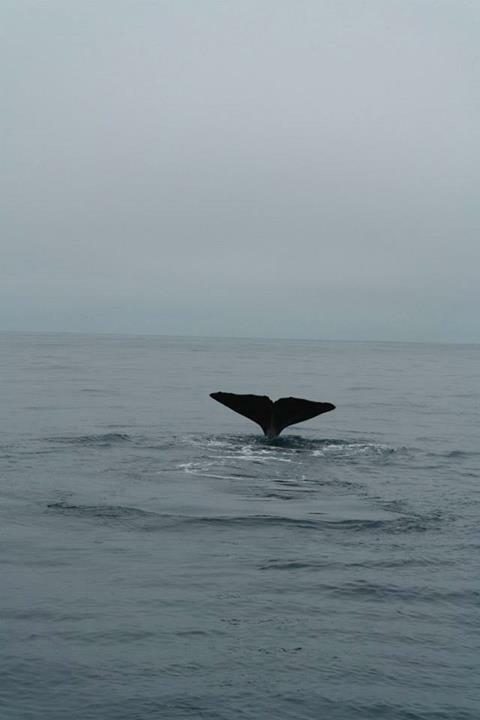 Kaikoura Whale Watching in Kaikoura, New Zealand was the perfect choice for me. While I chose between one of their several tour times, I noticed that they also offered whale watching by plane or helicopter! While that was a bit out of my reach this time around, I couldn’t help but wonder what it would be like to see these creatures from the air. Someday! As I settled onto the boat for our trip into the open waters off Kaikoura, I was pleased to see a television screen in plain view. 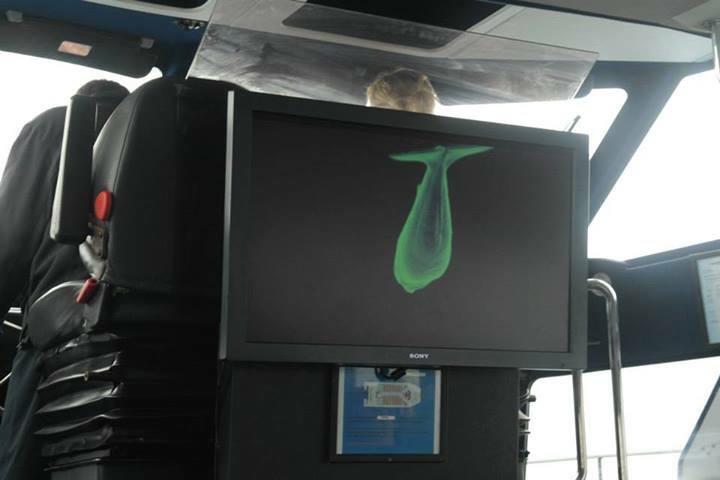 Then I was enthralled as a program detailing the different types of sea life we might encounter. The program went on to explain the creatures’ sizes, diets and behaviours. That combined with the guide on the boat who did the loudspeaker narration made me feel like a veritable expert! The 3-D display about all things cetacean. We also learned that, as far as cetacean habitats go, Kaikoura is a perfect storm, so to speak. Deep trenches and canyons just off shore, combined with warm waters and abundant food sources, combines to attract sea life of all varieties. The sperm whales live in the area year around. They dive to snack on giant squid at depth, then surface to breathe. 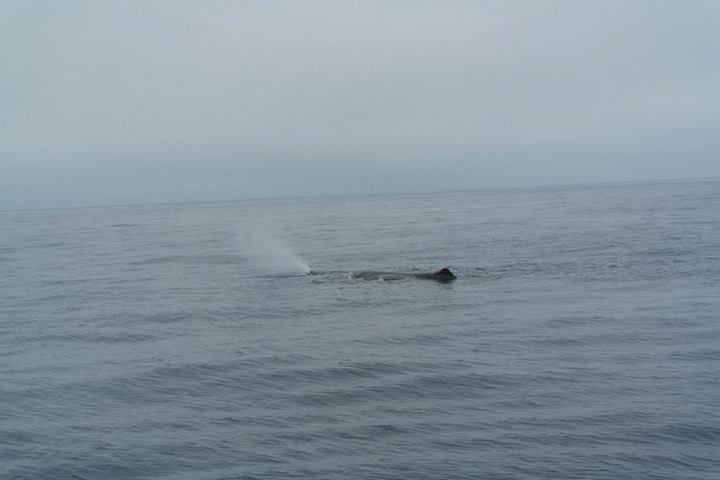 Humpback, blue, pilot, and southern right whales visit the area seasonally, and orcas, the largest dolphin species, and Hector, the smallest dolphin species, can be seen as well. So many beautiful creatures, so little time! The boat guides lowered a device into the water that emitted a strange sound and before we knew it, a small pod of five dolphins came to investigate! They frolicked around the boat as myself and the rest of the passengers all vied for the best vantage point. I was so amazed, as I had never seen a dolphin before, that I forgot to take a photo! Then it happened. A magnificent whale rose to the surface just off the boat’s side. She did a lazy roll and as the light glinted off her sleek, wet skin, she made a saucy tail flip and disappeared beneath the sea. I’m glad that, this time, I had the wherewithal to get a few photos because, frankly, I was stunned by the perfect beauty of the moment. And goodbye! Lovely to see you! It’s hard to adequately sum up the feeling that a glimpse of these animals in their native habitat gave me. It made me feel small compared their immense size, yet I also felt larger than life, and secure in the knowledge that all creatures deserve respect as we inhabit this crazy, beautiful planet together. A little knowledge goes a long way, especially when it relates to our oceans and the future of the creatures that all it home. I seen whales off the coast of South West Australia but have yet to go out on a boat chasing them.. Bet it gives ya a shock when you see the size of them?! Beasts, mate! And I’ve been scuba diving a lot recently so been getting up close and personal with them. 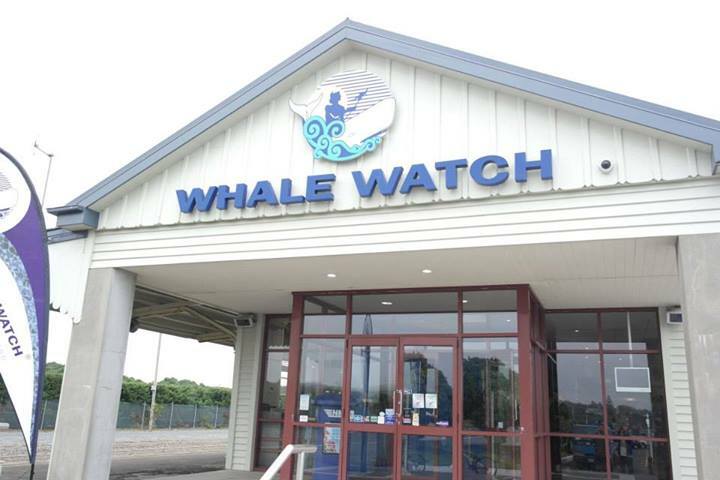 Thanks for posting a beautiful post about most famous New Zealand Attractions Kaikoura Whale Watch center.